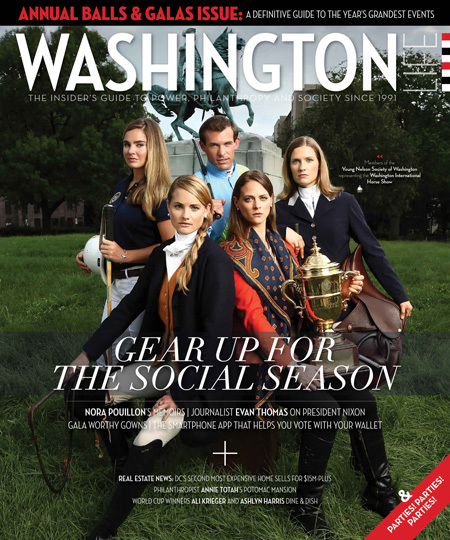 September 1, 2015 –The Washington International Horse Show (WIHS), one of the most prestigious equestrian sporting events in North America, announces the launch of the Young Nelson Society of Washington. a select group of philanthropic young professionals that celebrates the history and charitable efforts of WIHS. Named in honor of Old Nelson, George Washington’s prized war horse and one of America’s most valiant equine heroes, the Young Nelson Society (YNS) of Washington applauds the bravery, inspiration, strength, and joy a horse lends its rider or partner, whether on the battlefield, in the show ring or in a therapeutic capacity. Comprised of young professionals ages 23-39, YNS will provide additional support to local WIHS affiliated charities. The group supports organizations embracing the courage, bravery and trust needed to achieve independence and overcome adversity, like the partnership between Washington and Nelson. Fundraising efforts will benefit community organizations and charities that reinforce the importance of military family support, therapeutic riding programs for veterans and breast care centers, a cause close to the hearts of many in the equine community, in the D.C. region. The inaugural chairs were selected based upon their philanthropic work in the community, and will be chaired by Mallory Lobbiser, of Arlington, a certified public accountant with MOKO Social Media and an amateur show jumper with a long history of serving in the therapeutic riding community. The YNS co-chairs are: Mo Baptiste, Middleburg, VA. director of marketing for MB Stables LLC and a show jumping professional; Whitney Burns, Washington, D.C., director of marketing for Hines and an active fundraiser with the Washington Humane Society and Capital Canines; Justin Batoff, Baltimore, MD., a lawyer with Batoff Associates, amateur steeplechase jockey and co-founder of the Old Line Society, a 501(c)(3) charitable organization encouraging social engagement and fundraising efforts among young professionals; and Olivia Stringer, Monkton, MD., a polo professional and executive member of the Old Line Society. Established in 1958, the Washington International Horse Show is one of the oldest and most prestigious equestrian sporting events in the United States. Held in the heart of the nation’s capital, WIHS has hosted U.S. Presidents, First Ladies, celebrities, senior government, military and diplomatic officials and local and national business leaders in its storied 57-year history. In 1963, First Lady Jacqueline Kennedy donated the prestigious President’s Cup, commissioned by Tiffany & Co. and bearing the Official Seal of the President of the United States. From October 20 – 25, 2015, WIHS will draw 26,000 spectators to watch more than 500 horses and riders from around the globe vie for $500,000 in prize money in the Olympic-level competition. The roster of events includes the $125,000 Longines FEI World CupTM Jumping Washington, the President's Cup Grand Prix presented by Events DC, (Saturday), The Boeing Company Puissance high jump competition on Military Night (Friday) and Kids' Day (Saturday), a free, fun and educational community event. 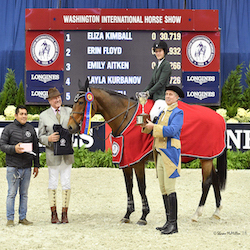 The Washington International Horse Show Association, Ltd. is a 501(c)(3) nonprofit charitable organization headquartered in Washington, D.C. WIHS is an official USEF Heritage Competition and is recognized as a Top 25 Horse Show by the North American Riders Group. WIHS is rated CSI4*-W by the Fédération Equestre Internationale, the world governing body for horse sports. Young Nelson Society Chairs will also be feted as they are featured on the front cover of Washington Life Magazine September 2015 issue. For an invitation, please contact Mallory Lobisser at mallory.YNS@gmail.com or Nara de Sá Guimarães, WIHS Director of Marketing & Communications, at nara@wihs.org. Visit us at http://www.wihs.org/young-nelson-society/ Follow WIHS on Facebook https://www.facebook.com/YoungNelsonSociety.